I talk openly about Emmy having Williams syndrome. I don’t tell every stranger I meet but, if it comes up, I’m ok with sharing our experience. 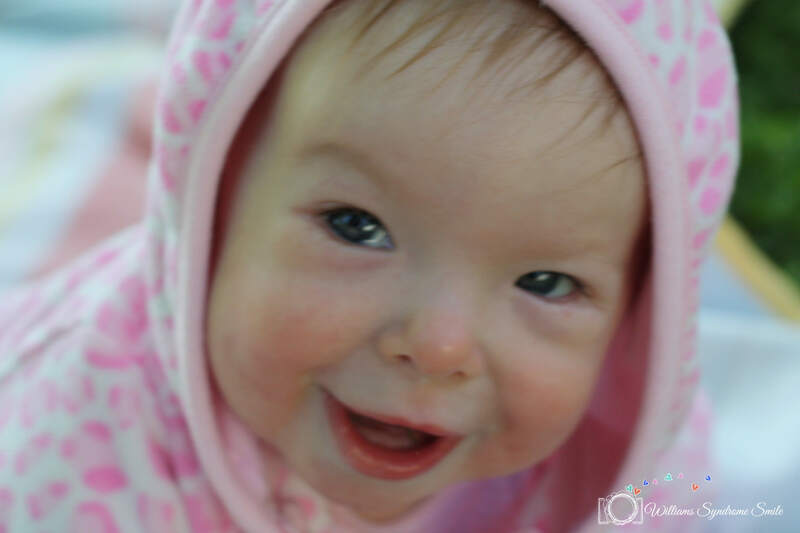 When we first found out about Williams syndrome, when Emmy was 5 weeks old, we were advised not to publicize it just yet. A doctor told us that not everybody would understand what the diagnosis meant, and she wanted people to get to know our family before labeling us as “the others.” As time has gone on, and especially as I’ve gotten incredible support from those around me, I’ve felt much more comfortable sharing our story. I know that some people keep quiet about a diagnosis because they don’t like that their child has a label. But I believe Emmy is much more than a label. If I believe that, and I project it, then I’m hoping others will see Emmy in the same light–as a whole person. I had it all mapped out. I just needed to wait another 2 years for her to really get it. While I was waiting, I realized that I couldn’t explain things to Charlotte fully. I couldn’t really explain why we have therapists coming to the house to work with Emmy. I couldn’t really explain why I take trips to Kentucky with Emmy to see a special team of researchers. I couldn’t really explain why she had a “boo-boo on her heart.” I couldn’t really say why we were doing walks with hundreds of people to raise awareness. Sure, I was coming up with decent explanations, but they weren’t getting to the real, core issue. 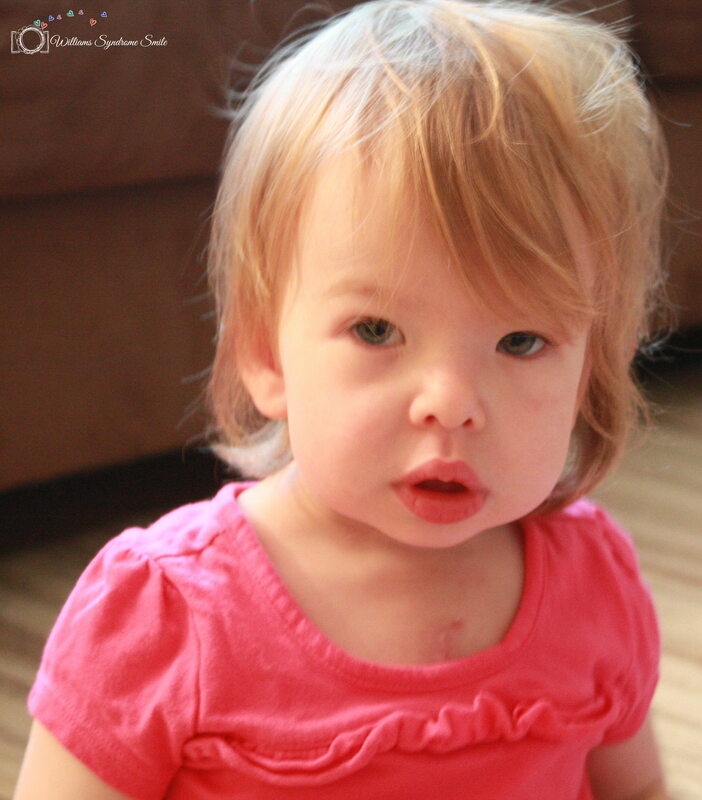 I longed to tell Charlotte that Emmy has Williams syndrome, but I didn’t know if she was ready. Honestly, I didn’t know if I was ready. 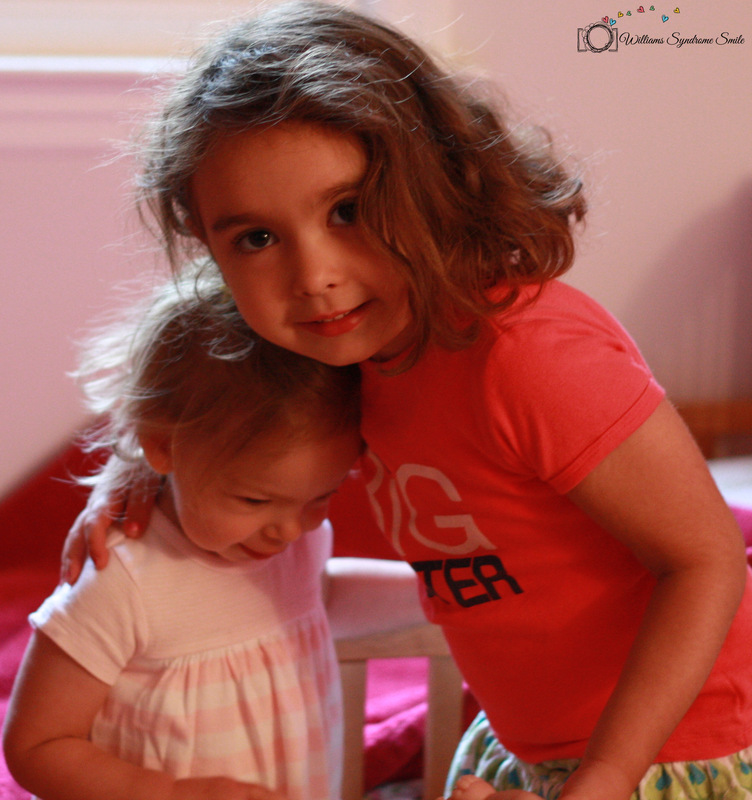 I was worried that Charlotte would see her sister differently, and that thought terrified me. I posed a question to our trusty Williams syndrome community. Was Charlotte too young? And, moreover, how do I even tell her? I knew the book/chapter analogy wouldn’t make sense for her age. As always, I got lots of great advice. Most importantly, when telling Charlotte, I had to keep it simple and general. Only give her as much information as she needs. She will ask for more when she’s ready. I was really surprised! I thought, for sure, she had heard us say it. Though, usually, Dan and I say “WS” because it’s shorter. And here is where my story falters… Because as confident as I felt 2 minutes prior, as much as I thought I was ready to tell her, I doubted my ability to deliver the message correctly. Whoopsie! I dug my hole and couldn’t get out. I gulped and looked over at Dan, raising my eyebrows helplessly. This launched Charlotte into a 10 minute discussion about her hair versus Emmy’s hair, which made me realize just how precious a 4 year old mind is. Then the discussion tapered off. And, suddenly, I felt lighter. I didn’t even realize that I had been clinging so tightly to this secret that it was pulling me down. I hadn’t even considered it a secret. I just thought Charlotte wasn’t ready. But, in keeping it quiet, I felt like I wasn’t including her in our lives. Everyone else knew but Charlotte. I didn’t realize that the weight of her not knowing was affecting me so deeply. So I got up from the dinner table and, in doing so, I left that heavy anchor behind. I have to be honest. Before Emmy had heart surgery, I was really worried about the scar. Baby skin is so pure and soft. It symbolizes newness and promise and possibility. Whenever they show diaper commercials on tv, they zoom in on the baby’s chubby, soft, flawless skin. Babies aren’t hardened adults with tough skin yet. They don’t know about the world and its difficulties. So the idea of cutting into Emmy’s gentle skin just slayed me. Plus, I’m squeamish. I can faint at the sight of blood or anything resembling an open wound. When I was in middle school, I cut my finger in Woodshop class. I looked down at the blood and fainted, falling backwards and hitting my head on a metal filing cabinet. I was taken to the emergency room for the major gash in the back of my head, not the tiny cut on my finger. So I was nervous. But I was desperate to be there for Emmy and not let my embarrassing squeamishness get in the way. When Emmy first came home from the hospital, I was so happy to have her home that I felt like I shouldn’t care about the scar. My head told me to just be thankful that she was alive. But every time I glanced at the scar, I thought I was going to faint. From what I’ve seen of other kids, Emmy’s scar is particularly noticeable. Her surgery was back in May, and the scar still looks reddish pink. (Don’t worry — she doesn’t have an infection.) I think it’s because she was on life support for almost a week, and her chest remained open during that time. It didn’t heal as cleanly and quickly as some other scars I’ve seen. Emmy, on the other hand, seems quite comfortable with her scar! She points to it and say “boo boo.” She lifts up her shirt for people to see. One woman remarked that she seems proud of it. I hope she is. She sure earned it. I hope I can continue to foster Emmy’s pride in her scar. A nurse recently said that she doesn’t like the term “congenital heart defect” because it attaches a negative connotation to something that kids should actually be proud of. They don’t have the scar because they’re defective. They have it because they are downright amazing. I joined a group on Facebook called “Mended Little Hearts” for families of children with Congenital Heart Defects. Every time they post a picture of a little boy or girl and I see that scar peeking out from the top of a shirt, I feel an instant connection with a stranger. “Emmy has that too,” I think. The scar didn’t mar her skin like I feared it would. It didn’t take away from her beautiful, soft, gentle baby self. She still is my snuggly sweet little girl, full of promise and possibility. And now she has a badge of courage too.